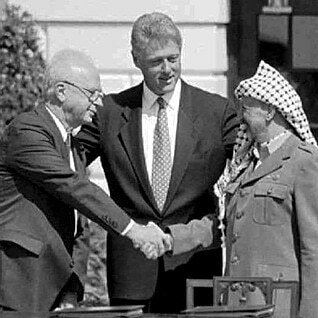 In the Declaration of Principles of 13 September 1993 (Oslo-I), the State of Israel and the PLO recognized ‘their mutual legitimate and political rights’, promising to ‘strive to live in peaceful coexistence’, and to ‘achieve a just, lasting, and comprehensive peace settlement and historic reconciliation through the agreed political process’. This process was made up of two phases: 1) in an interim period of five years, a Palestinian interim government would be set up in parts of Palestine; 2) after phase 1 had taken effect, negotiations would commence to find a definite answer to issues such as Jerusalem, the Palestinian refugees, the Jewish settlements, water and the borders. Unclear boundaries and the establishment of a Palestinian state were left off the agenda. In the Madrid negotiations, the Palestinian delegation had refused to view the two issues separately, fearing that Israel only had an interest in the first phase and that the second, as a result, would not be effectuated. Both parties further agreed not to take any actions which could negatively influence or nullify the outcome of the negotiations regarding these issues. The details about the interim administration were settled in a separate agreement on 4 May 1994, thus allowing procedures to commence, and by 4 May 1999, according to the timetable, matters should have been settled between Israel and the PLO. Based upon a second agreement (Oslo-II) of 28 September 1995, the West Bank and the Gaza Strip were divided into so-called A, B and C Areas. Area A covered the large Palestinian population areas, excluding East Jerusalem and Hebron, from which Israel was to withdraw. After carrying through a few modifications, these covered 18.2 percent of the total territory. Here, both the civil and military administration was to be placed in the hands of a Palestinian Authority – the Palestinians speak of a Palestinian National Authority (PNA). The B Areas were the villages and their direct surroundings; 21.8 percent. Here, the civil administration was in the hands of the PNA, whereas the military administration remained under Israel’s control. In the C Areas (thinly populated areas where there were also Jewish settlements and Israeli military bases; 60 percent), both the civil and the military administration remained in Israeli hands. Both accords rested on mutually dependent agreements. The solution of the Israeli-Palestinian conflict was not based upon international law. In fact, the agreements made were technically illegal since according to international law territorial expansion by means of violence is prohibited. Israel should, therefore, within the framework of an agreement with the PLO, have committed to ‘total withdrawal’ from the territories occupied in 1967. However, on the basis of the Oslo Accords, the ‘degree of withdrawal’ was made subject to further negotiations. As this depended on Israel’s willingness in these matters, the end result would probably be determined by the outcome of a debate within Israel rather than by negotiations with the PLO. In addition, Arafat’s party had made concessions to Israel on many essential points for the Palestinians, and the net result was a continuation of Israeli dominance under a different guise. Nevertheless, from one day to the next, Israel’s image had been transformed from an occupying power – which had only recently suppressed the intifada with tough measures – into a negotiation partner of the PLO. By abandoning the path of international law, the PLO committed itself to an uncertain adventure, thereby hazarding the Palestinian people’s interests. That the situation had come to this cannot be viewed separately from the organization’s now strongly weakened position: in exile in Tunis, financially destitute, and confronted with a loyal yet self-confident leadership in Palestine. For the exact same reasons, Israel sniffed at the opportunity to come to a political arrangement on its own terms with an organization which, because of its historical role within the national movement, was still in the position to enter into agreements on behalf of the Palestinians. To the outside world, it appeared that a historical compromise had been reached by two sworn enemies. The theatricalities strengthened this impression: historical handshakes on the lawn in front of the White House and the world’s press, Nobel prizes and so forth. Although the euphoria was initially great in Palestine, Palestinians also immediately spoke against the agreements, using powerful arguments.